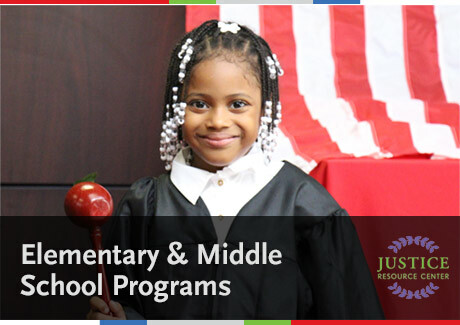 The Justice Resource Center (JRC) is the leading provider of law-related and civic education for the school-age population. Our history has defined the work we do at the JRC. The vision of the original founders of law-related education led the JRC to become an international model, demonstrating what can be done in inner cities around the world. The JRC is an outgrowth of a Mayoral Blue Ribbon Commission formed, in 1988, by the late Mayor Edward Koch, whose mission was to establish the first Law and Justice program in NYC public schools. The commission was led by a prominent attorney, Tom Evans, and the late Police Commissioner Benjamin Ward. The Commission members were heads of agencies throughout NYC. The first Law & Justice Institute was established at Martin Luther King, Jr. High School. After the first four years of the Law & Justice Institute, 99% of the students in that first year program went on to college and the remaining 1% enrolled in the military. Based on its success, the program was replicated throughout the NYC public schools. Approximately four years before the commission was formed, Tom Evans, former president of the Federal Bar Council, had envisioned an opportunity for lawyers to play a role in educating high school students about the legal system. To carry out that vision, he created the MENTOR: law firm/school partnership program. MENTOR paired major firms with New York City high schools to create an opportunity for private lawyers to speak at public schools, for students to visit law firms to understand a firm’s inner workings, for students to participate in a high school moot court competition, and for lawyers to bring students to court to observe legal proceedings, meeting with judges and court personnel. Based on Tom’s work with the MENTOR program, former Mayor Koch invited Tom Evans to be Co-Chair of the Mayoral Blue Ribbon Commission. When the Commission ended, Tom Evans, along with others, were committed to preserving the Law & Justice Institute that the Commission had created in the NYC public schools. This group then recruited lawyers who had been most active in the MENTOR program to create the Justice Resource Center, ensuring the continuation of the Commission’s law-related education programs in New York City. The newly formed Board of Directors, envisioned a center that would expand the MENTOR program, replicate the law and justice model and serve as a conduit for lawyers to serve the public school children. This same vision presides today. The JRC is the center of law-related and civic education, offering schools around the world the opportunity to replicate any of the 30 different programs at the JRC. The JRC Board of Directors continues to engage and mobilize the legal community to support the JRC’s program.